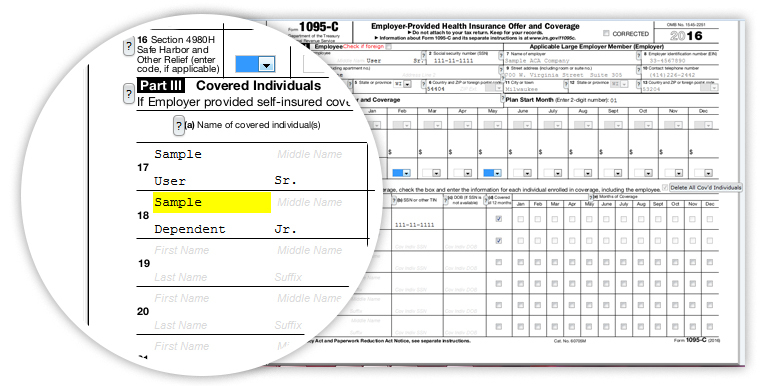 The IRS Forms 1094/1095 module offers quick and effortless form completion and e-filing, helping to satisfy the ACA reporting requirements for you or your clients and ensure compliance. Avoid manual data entry. Upload employer, employee, and dependent data via .csv templates for automated data entry into forms. Fast. Generate final forms instantly in .pdf format. Extensive online error correction. Context-sensitive help buttons, as well as edit checking. Batch printing. Available for all forms. Fulfillment service. Our fulfillment service will mail employee copies on your behalf and e-file data to the IRS. Additional fees apply.